Knowledge of all aspects of leak testing, specialists in small volume air decay leak testing. All items leak, the question is when is a leak an actual leak that will cause a part to fail in service. 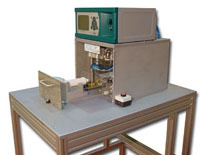 TQC Medical develop systems to enable quantifiable testing of components to leak test specifications. If the test specification is unknown we can also calculate the parameters that would ensure that the part will not leak in service, e.g.. a saline containing part will be tested using air to ensure no water leakage occurs. Once the leak testing basics have been understood, the next decision that can be made is based on what product you want to test, or what test method you want to implement. Click through to the relevant page to find out more.